Sales of H.P.’s hand-held products, including its iPaq smartphone, dropped to $25 million in the quarter, down from $57 million in the same period last year. 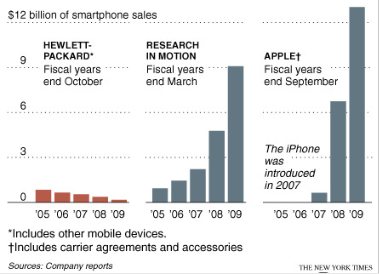 Apple, by contrast, had sales of $5.6 billion for iPhones and related products during its most recent quarter. To put it in more perspective, $25 million at an ASP of $350 a phone means HP sold about 70k phones last quarter, or what Apple sold every 17 hours.